Ok wow. It's here. It's actually totally here. Welcome to the last link up of Elah Tree and my Cooks in the Kitchen Challenge! Yep, you read right- after today's link-up, we are totally done! Cue all the tears. I can't believe it's over! I mean, it literally seems like maybe a month or so ago that Samantha and I were first talking about this dream, planning, and getting it all together. We discussed doing it through the summer and when I thought about "ending in September" that seemed like eons away! And here we are. September The end of summer. The end of this little chapter. It's craziness. This month's ingredient was a fun one- PEARS. How did you guys do with the fruit? Did you have an awesome time dreaming up delicious recipes? Or was it a sort of challenge? 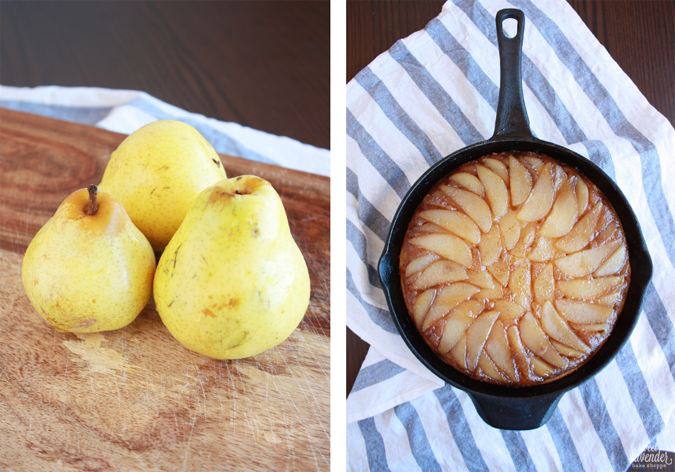 I love pears and love to bake with them like no other. Last year I made this pear with almond cream pie for my sister's birthday and swooned for days. 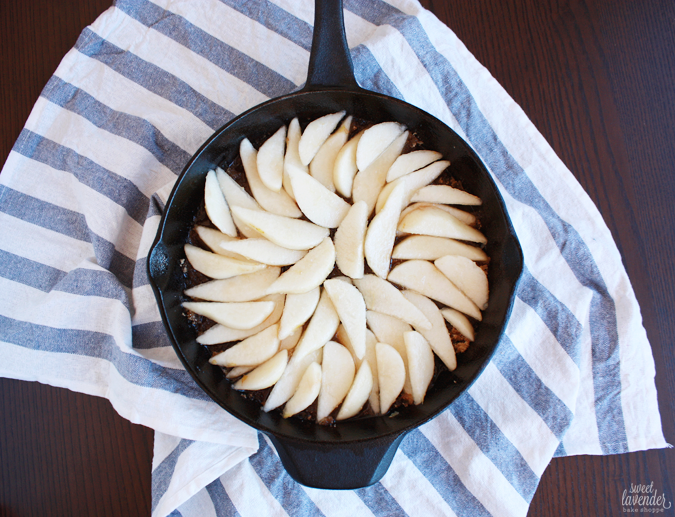 There's something really comforting about baking with pears and apples in the fall. This time, I decided to take an old classic and vamp it up a bit. We all know and love Pineapple Upside Down Cake...but what would it taste like with the less tart (but equally delicious) Bartlett Pear? This month's challenge was the perfect time to find out! But first. Guys. Did you read Samantha's recipe? It's a Grilled Pear Panini with raspberries AND BACON! Say what????? Be still my sweet and salty loving heart. This one's getting pinned for sure! 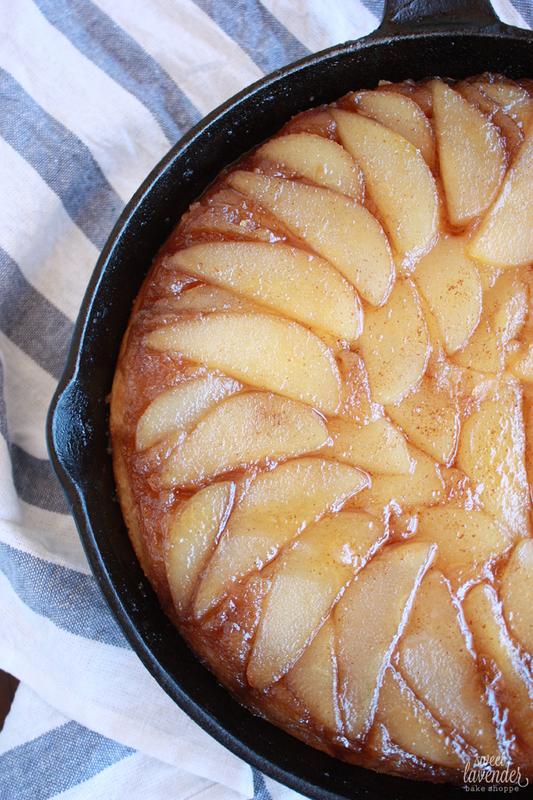 If you're heading to a dinner party (like I was) or shoot, just want to have something nice at home for the fam- this Pear Upside Down Cake has got you covered. 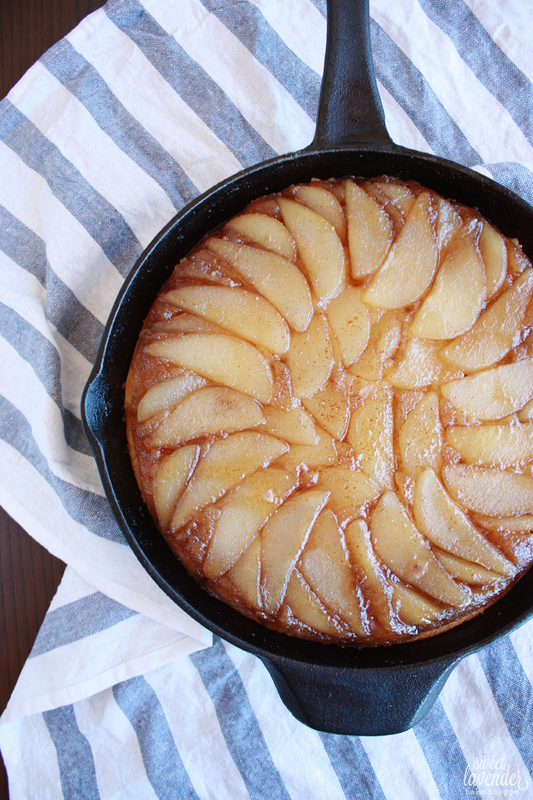 Caramelized pears and browned butter top a lightly sweet yellow cake? Yeah...I'll take a slice. 1. Preheat oven to 350°F and using the butter wrapper (or oil spray), grease the sides of a 9" cake pan. Set aside. 2. Peel pears and slice 1/4" thick, avoiding and discarding the core and stem. Add pears to a non-reactive bowl and toss with the 2 tablespoons whiskey. Set aside to marinate. 3. In a small saucepan, add the 4 tablespoons unsalted butter and over medium heat, gently brown. This should only take a few minutes, so stay with it. It can quickly go from nutty and browned to bitter and burnt. 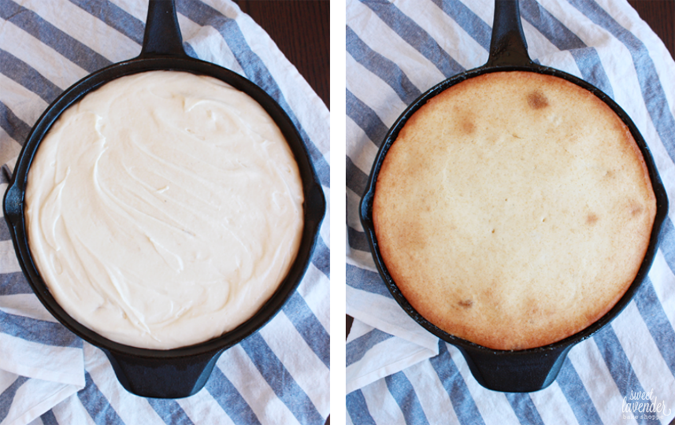 Pour browned butter into the bottom of your prepared cake pan. I used a 9" cast iron skillet for this, only because it was aesthetically pleasing to me on this particular day :) Both work just fine, but note that if you choose to use a cast iron skillet, you'll have to bake your cake for about 10-15 minutes longer than the time in these instructions. 4. Next, sprinkle the brown sugar over the butter and gently spread out so it covers the entire surface. Finally, arrange the marinated pear slices over the brown sugar in a nice, even layer. Reserve the pear whiskey liquid for your cake batter. 1. In a bowl, mix together the all purpose flour, baking powder and sea salt. Set aside. 2. In the bowl of a stand mixer, add the butter and vanilla sugar and beat on medium high using a paddle attachment, until light and fluffy. Stop mixer and scrape down sides and bottom. Add the egg and beat until incorporated. Stop mixer and scrape down again. Mix once more. 3. While that is fluffing and mixing, in another bowl or measuring cup, mix together the room temperature milk, reserved pear whiskey liquid and vanilla extract. 4. With your mixer on medium low, alternate the flour mix with the milk mix into the butter and sugar, pouring in half of each at a time. Start with the flour mix. Stop and scrape down sides before adding the next half. Once everything is mixed in, beat batter for about 10 seconds on medium high to really incorporate. 5. 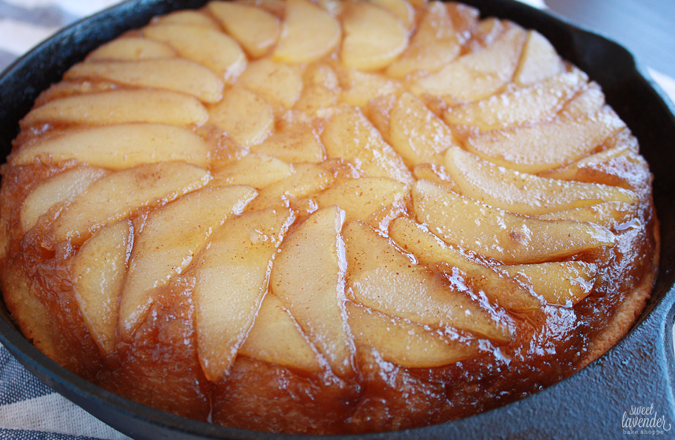 Carefully pour batter into your prepared cake pan over the pears and gently spread out into one nice even layer. Pat pan on counter a few times to settle the batter into the nooks and crannies. Place pan on a tinfoil lined baking sheet and place in the center of your preheated oven. 6. Bake cake for about 35-40 minutes (adding 10-15 minutes more for cast iron), turning 1/2 way through to ensure even cooking. Cake is done when it is amber brown around the edges, liquid is bubbling on the sides, center is golden in color and a toothpick comes out clean when inserted in the middle (careful not to go all the way down). 7. Remove cake from oven and allow to cool 5-10 minutes before trying to flip. Once cool enough to handle, place plate or cake platter over top and very carefully, flip entire thing over. Gently remove pan- everything should have nicely landed on that plate. Let cool slightly before serving, or serve later that day! For my dinner party, I wanted to serve the cake IN the cast iron skillet. So after I flipped the cake over onto a plate, I gently slid it back into the pan- bottom side up. Presentation wise, this was pretty neat. Cake is best eaten day it is made, BUT it can be made completely a day ahead and served the next day. Just allow to cool completely, wrap gently in plastic wrap and store in the refrigerator. Allow to come to room temperature before serving. Cake slightly adapted from this recipe. 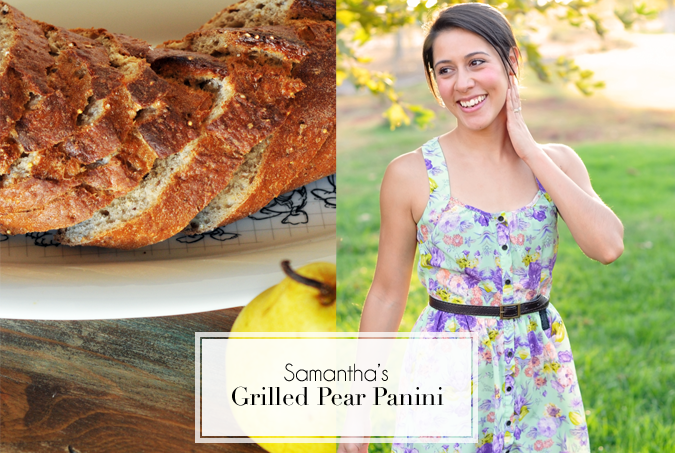 How did your pear cooking adventures come together? I can't wait to see what you have for us! Because today is our final link up we wanted to do something special! 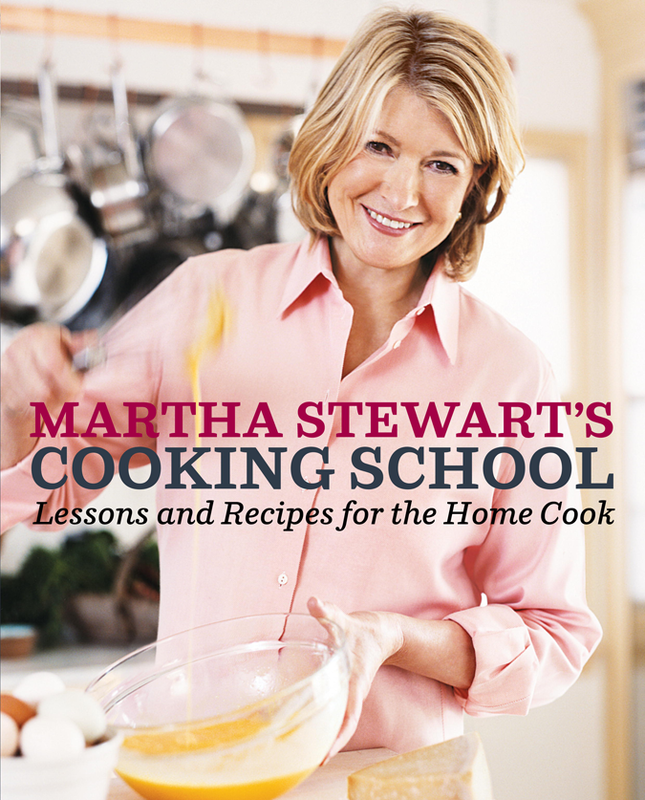 Samantha and I are giving away a copy of Martha Stewart's Cooking School to one of you lovelies! Wahoo! There are lots of ways to enter; if you have linked up with us for the entire link-up you can use those as entries too! Entries will be run via rafflecopter below. The giveaway will close in 7 days, at that time one winner will be chosen at random. The winner will be announced within seven days of the closing day and will receive an email. They have 24 hours to respond or forfeit the prize. Entries will be verified and reviewed at the discretion of Elah Tree and Sweet Lavender Bake Shoppe. Any falsified entries will be disqualified. This giveaway is open to U.S. residents only. Prize was graciously bought and donated by Sweet Lavender Bake Shoppe and Elah Tree. We'll miss you friends! Hope you had a serious blast! I agree - pears are such a great ingredient for fall! And this recipe looks so amazing - I wanted to make something more ambitious, but ran out of time so had to find something easier. I'd love to try this recipe later! Since pears are fresh on the brain, I'm going to have to say pears were the most fun month but it's a tough choice. These were all so fun!!! Thanks for putting this together!! You're so welcome! Thanks so much for being a part of it!